Aiming for a repeat success, aiming to climb one step higher and avenge the defeat of one year ago; those are the respective targets of India’s Sathiyan Gnanasekaran and the host nation’s Cédric Nuytinck at the forthcoming 2017 ITTF Challenge Belgium Open. Play commences in De Haan on Tuesday 31st October and concludes on Saturday 4th November. At the 2016 ITTF World Tour Belgium Open, Satihiyan Gnanasekaran beat Cédric Nuytinck in the final of the Men’s Singles event; if there is to be a repeat of that contest, both players will not only have to show their best form, arguably they will have to exceed their best form. Cédric Nuytinck is the no.7 seed, Sathiyan Gnanasekaran is the no.11 seed; a competition that fields players who, like the visiting Indian, have captured ITTF World Tour Men’s Singles titles. Portugal’s Tiago Apolonia is the top seed followed by Germany’s Ricardo Walther and Sharath Kamal Achanta, also from India. In 2010 Tiago Apolonia won in Austria, Sharath Kamal Achanta in Egypt; four years later Ricardo Walther succeeded in Croatia. Additionally, further down the list, Korea’s Kim Donghyun won in 2015 in Bulgaria; in 2012 Russia’s Vasily Lakeev succeeded in both Belarus and Egypt. In De Haan, Kim Donghyun is the no.8 seed, Vasily Lakeev, the no.15 seed. Recapturing form of bygone days is very much the task for Kim Donghyun and Vasily Lakeev; for three notable names who appear high in the order of merit it is a question of maintaining present form. Benedikt Duda, ever more competitive on the international scene in the no.4 seed in the Men’s Singles event; he is followed immediately by German compatriot Patrick Franziska and Slovenia’s Bojan Tokic. Both Patrick Franziska and Bojan Tokic were outstanding at the recent Liebherr 2017 European Team Championships as Germany secured gold and Slovenia an unprecedented bronze. Likewise prominent Men’s Singles names are also very much in evidence in the Men’s Doubles competition, an event in which Belgium has high hopes. Winners on the GAC Group 2015 ITTF World Tour in the Philippines, Robin Devos and Cédric Nuytinck head the list with successful doubles players next in line. Patrick Franziska, who usually partners Denmark’s Jonathan Groth joins forces with Ricardo Walther, the erstwhile partner of compatriot Ruwen Filus. An opportunity for Robin Devos and Cédric Nuytinck to add to their collection of international titles; in the Under 21 Men’s Singles event, it is the same for Hong Kong’s Lam Siu Hang. 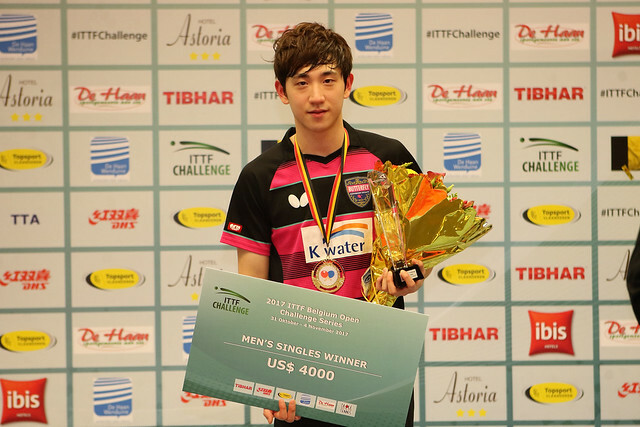 The winner earlier this year on the Seamaster 2017 ITTF World Tour in Qatar, he is the top seed; next in line is Slovenia’s Darko Jorgic, followed by Russia’s Sadi Ismailov; Ng Pak Nam, also from Hong Kong completes the top four names.